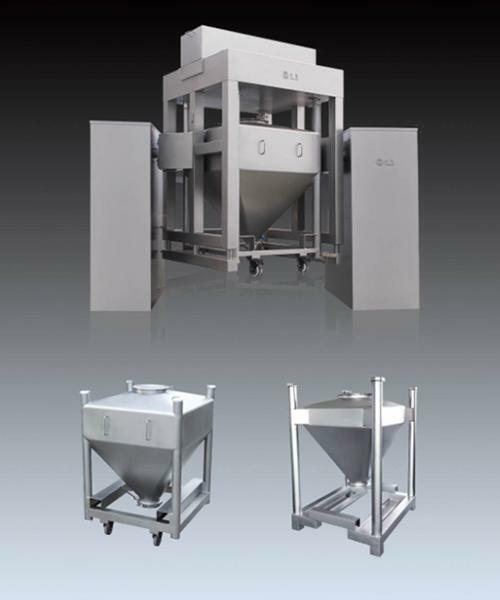 The HFD Series Bin Blender is an ideal blender used for mixing powders and granules together, most often in the pharmaceutical industry. Known for its high mixing efficiency and no risk of cross contamination and dust, the blender is used to satisfy strict batch control requirements, and complies completely with GMP requirements for medicine production. The bin blender is available with different bin sizes, with lifting, clamping, mixing, descending and clamp loosening all done automatically. A single blending machine can be outfitted with various bin specifications, making it a great choice for general mixing in pharmacies, as well as mixing applications in chemical, light, and food industries. 1. This bin blender features a novel design, with a sleek, compact appearance. The mixing evenness reaches more than 99%, with a volume charge coefficient of 0.8. 2. The blender has a low rotating height, smooth running and a reliable performance, as well as easy operations. 3. Mirror polish is used on the inner and outer surfaces of the bin, and the bin itself is easy to unload and clean with no cross contamination, thus conforming to GMP standards. 4. The system is PLC controlled, the sensor is photoelectric position controlled, and the drive system is composed of motors, so that it can control both the mixing time and unloading position. When the blender is stopped, the discharge port is automatically in the best position for unloading. 5. The locking clamp structure of the loading cover bolt is easy to disassemble, clean and seal, with no leakages even after testing with filling with water at 80% of the total volume. 6. Silicon soft connecting is used for the connection between the inlet/outlet of the bin, as well as other equipment portions, thus avoiding any dust emission. 7. The patented discharge butterfly valve is easy to disassemble, operate and clean, with no leaks, even after extensive testing. It has been used on thousands of blenders and has been well-received by customers. 8. Overload alarm, with isolating fence, alarm lamp and buzzer.